Get in the game with a limited-time video game sale at one of the most popular technology stores. Best Buy is offering select video games for $29.99 to $39.99 (regularly $59.99 each) as the retailer’s Deal of the Day. This means the electronics store is offering customers savings of $20 to $30 off per game. 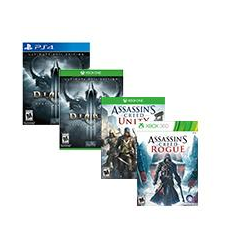 Included in the assortment of games are popular titles such as “Assassin’s Creed: Unity” and “Assassin’s Creed Rogue.” Check the selected games for one that suits your gaming platform of choice, from Xbox One to PlayStation 4. Shop the sale at Best Buy.